While at first I was leaning towards the title “Lake Tourist-Trap,” a few additional days around Lake Titicaca, including three of the most spectacular sunsets I have ever seen, have left an overall positive impression. My Lake Titicaca experience started in Puno, the launching point for a two-day, one-night trip to three of the lake’s islands. The first stop was Uros, the floating reed islands that we have seen in history and guide books. I was looking forward to not just seeing the islands, but also getting a glimpse into what is supposed to be a very traditional, isolated society. Instead, upon disembarking from the boat, we were literally pulled into individual homes, draped in “traditional” clothing, and then practically yelled at to purchase souvenirs. “Amiga! Compre! Compre! (Friend! Buy! Buy! )” This was so overwhelming that our entire group ran back to the boat 15 minutes short of the allotted time. Not exactly what I had envisioned. The next stop was the island of Amantaní, a 3-hour boat ride from Uros. Upon arrival we were randomly assigned to individual family homes, where we had been told we’d help cook, clean, and simply be a part of the family unit during our visit. Instead, our help was not accepted and we sat staring awkwardly at the mother as she prepared our lunch and dinner. The family would not join us at the table, instead choosing to have their own conversation in Quechua (a native Andean language) in the corner of the “kitchen.” The oldest children laughed at our attempts to engage them. It was quite bizarre. After dinner, we were dressed up in traditional garb and marched down to the “saloon” for a “fiesta.” When we arrived, we found an open hall with a “drink” stand and four young boys playing traditional music for tips. The locals grabbed our hands and spun us in circles, all the while looking quite bored with the whole thing. One highlight during our time at Amantaní was a short hike to the tops of Pachatata (Father Earth) and Pacahamama (Mother Earth). The views were beautiful, especially at sunset. However, once you reached the top, six young girls followed you around, demanding that you buy a yarn bracelet. They were like flies, with no memory of who had already shooed them away, repeatedly returning and standing directly in front of your beautiful lake view. Our final stop was the beautiful island of Taquile, where we arrived well before the heaps of single-day tour boats. It was the first time that we saw some fragments of normal daily life—adults weaving traditional garments, children going to school, men heading to the fields—and was therefore my favorite of the tour. By the time we retreated to the dock, dozens of women were setting up stands with exactly the same items as the next, urging us to buy. Adios Lake Titicaca—it’s been real. After reflecting on the experience, I’m not upset with the constant hounding for money. Life on the islands is difficult—agriculture is sparse, winters and nights harsh, and secondary education nonexistent. It’s no wonder that the daily tourist boats carry with them the hope of more money and security for one’s family. The next day I crossed the border to Bolivia and pulled in to the small lakeside town of Copacabana. I splurged on one of the nicest hotels, with a waterfront view, for around $11.50US/night. I like Bolivia already. I spent two lazy days reading, watching movies in Spanish, and working on a photo book of my trip. It was quite lovely. 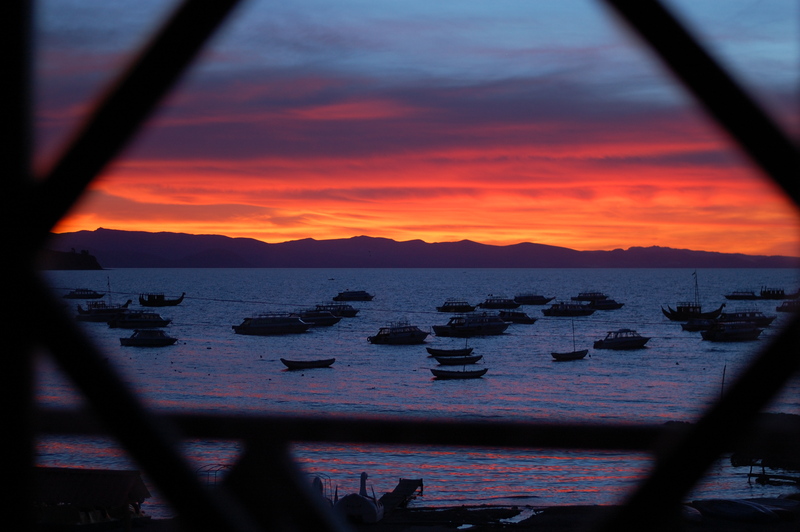 I can also say, with complete conviction, that the Lake Titicaca sunsets are the best that I have ever seen. They more than made up for the previous days of tourist trapped-ness. Kind of reminds me of some places I have been in Mexico. People hawking all sorts of things on the streets and beaches who surround you waving their wares in your face. Still and all everyone has to make a living and probably the only folks with money to spend on non-essentials are the tourists. So, enjoy the scenery and your brief glimpses of local culture and try to blank out the commercialism. Sunsets are amazing, worth the small annoyance of commercialism. Totally had a similar experience visiting Angkor Wat in Cambodia. Beautiful pictures and can imagine your time in Bolivia.